It’s one of Australia’s greatest mysteries. For decades there has been talk of big cats roaming the Australian bush. These large cats – predominantly black – have only afforded their witnesses fleeting glimpses, and left behind tantalising clues: scraps of fur, a paw print or three, unusually large scats, and livestock carcasses surgically dismembered and picked clean of flesh. In their wake, they leave carnage and bewilderment: What are they? How did they get here? We don’t just ask the questions, we seek the answers, and what we have found will intrigue the sceptic and the believer alike. Big cat sightings have been occurring with greater frequency across the country in the past 20 years, leading to speculation there may be a breeding colony of large cats in Australia. Australia isn’t the only antipodean country touched by the black cat mystery. 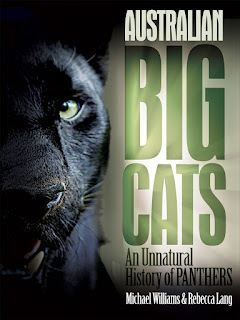 Australian Big Cats: An Unnatural History of Panthers also dedicates a chapter to the profusion of sightings and speculation in neighbouring New Zealand, documenting reports right up until 2009 and sharing for the first time highlights from the unpublished manuscript of New Zealand’s first big cat hunter. Flesh-and-blood or flight of fancy? Exotic pest, mutant feral or ‘extinct’ marsupial lion? Join us as we explore one of Australia’s greatest mysteries. Read our free book extract here.